The space shuttle Discovery has lifted off from Cape Canaveral - the first night shuttle launch in four years. 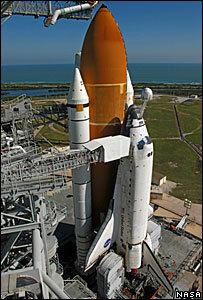 Discovery launched at 2047 (0147 GMT on Sunday), two days after poor weather forced a lift-off to be cancelled. 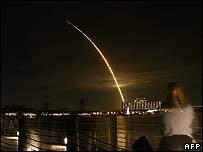 Rocket flares from the shuttle were visible in the night sky across much of the south-eastern United States. The shuttle is heading to the International Space Station (ISS), which Nasa is racing to complete before the shuttle fleet is retired in 2010. 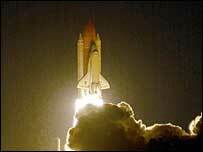 This is the third shuttle mission in six months and first night launch since the Columbia disaster in 2003. While in orbit with the space station, Discovery astronauts will carry out three spacewalks and will rewire electrical systems inside the ISS. Cloudy skies earlier on Sunday cleared as night fell in Florida, allowing mission controllers to proceed with the launch. There were no reported complications on launch as Discovery soared away from the Kennedy Space Center. It quickly reached a speed of 6,500 mph (10,500 km/h) as it headed through the Earth's atmosphere. Acknowledging a message of congratulations from the ground, commander Mark Polansky replied: "There are a lot of happy, smiling faces up here". "Forty-eight hours makes a tremendous difference," launch director Mike Leinbach told the crew. "Everything just clicked. Everything felt good today," he said later. Two days earlier the crew of two women and five men were seated inside the shuttle at the scheduled launch time of 2135 (0235 GMT), but low clouds prevented lift-off. A British-born astronaut, Nicholas Patrick, is among Discovery's crew. Five of the astronauts on the mission are going on their first shuttle flight. One of the seven, US astronaut Sunita Williams, will stay on at the ISS when Discovery heads home, taking German Thomas Reiter back to Earth. Nasa has described the construction mission as one of the most complex to date. At least 14 more missions are needed to finish the $100bn (£50bn) station. Discovery's flight is scheduled to last 12 days, with a landing targeted for 21 December back at the Kennedy Space Center. Discovery's crew consists of Commander Mark Polansky, pilot William Oefelein and mission specialists Robert Curbeam, Joan Higginbotham, Nicholas Patrick, Sunita Williams and the European Space Agency astronaut Christer Fuglesang.